When Dodge puts an SRT badge on any of its products you can usually expect something quite special, quite loud and very in your face. The Dodge Durango is a good-looking SUV, especially in top R/T trim with 360 hp on tap, but as usual, there are some who want more from an SUV. Dodge obliged by raising the power to a massive 475 hp, tweaking the styling and slapping that SRT badge on the tail. Of course all these extras come at a cost with the base version coming in almost $20,000 more than the R/T with a listing of $64,090. Some things are worth the money though. 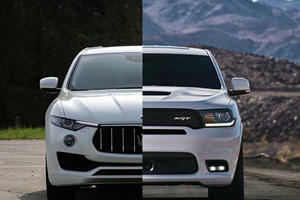 Inside an SUV with almost 500 hp, things are exactly what you’d expect – built for speed. The power adjustable front seats feature high bolsters like true race seats, but they’re covered in a choice of thick, premium Laguna leather, the same goes for the other 4 seats in the rear. Dash layout is good with the infotainment screen and climate controls centered together above the high center console that features a great looking electronic T-handle shifter. The multifunction steering wheel is quite busy with lots of buttons, but its leather bound, flat-bottomed and has affixed paddle shifters. The digital instrument cluster has a great layout with the tachometer being at center stage, showing it’s all about shift points and changing at the right spots that looking at the speed. The same goes for the infotainment screen display that can be set to show how many of the 475 horses are currently in employ. Gimmicky, but come one, you have to admit it’s cool. With so much power available in the Dodge Durango SRT, you can expect that everything around the engine has been upgraded to make the drive safe and reliable. The suspension is 3 percent stiffer in the front and 16 percent at the rear with an anti-roll bar that’s also 18 percent stiffer than in the R/T, and added to the adaptive Bilstein shocks the large SUV can actually attack the bends with confidence at speeds that defy what an SUV should be able to do. Acceleration can be brutal, as can deceleration thanks to the large Brembo brakes, but when driving normally the SUV manages to feel quite sedate. The 8-speed automatic transmission offers fast and precise shifts in Sport Mode, and feels smooth and friendly in Auto Mode, and there are still another 5 modes after them including a Tow and Valet mode, the latter to make sure the SUV is looked after when out of the owner’s hands. 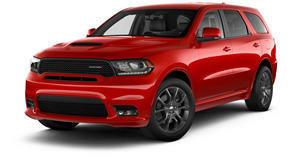 Performance and the Dodge Durango SRT go hand in hand, and to earn those three letters the 360 hp 5.7-liter V8 gets chucked in favor of a much more meaty 6.4-liter Hemi V8 that sees the power climb to 475 hp with 470 lb-ft of torque. Not only does this make the SUV the nest in class for towing, it also makes it ridiculously fast too. The 60 mph mark pops up in just 4.7-seconds with the top speed set at 155 mph. The quarter mile is extinguished in an almost unbelievable 12.9-seconds. The Durango SRT uses an automatic 8-speed TorqueFlite transmission with rev-matching technology and an all-wheel drive drivetrain. To keep you safe in the Dodge Durango SRT you’ll find a host of active and passive safety systems like 4-wheel traction control, an enhanced accident response system, rear park assist with stop function, advanced brake assist, full speed forward collision warning, blind spot warning and airbags in all rows of seating with advanced multistage airbags up front. Equipment includes some good tech like the 8.4-Inch touchscreen with navigation and downloadable apps, a rear seat video system and a Beats premium audio system – basically everything the R/T has on offer. It’s a strange world we live in when buyers demand an SUV in a sporty trim with copious amounts of power and a top speed of 155 mph, but that it is and so the Dodge Durango SRT was born. It’s a 6-seater people carrier that behaves like a racecar and is available at a great price point. With large 20-inch wheels and tight suspension, it’s always going to stay on flat ground, this is one SUV that won’t get you far off road, but you won’t care.